The PhotoPills Expedition to The Faroe Islands (August 12th-19th) is SOLD OUT now! All 12 spots are already gone! Be the first one to know when a cancellation occurs. An archipelago of 18 igneous rocks lost in the middle of nowhere. One of the most mystical sceneries on the planet! To achieve it, we’ll use the planning power of PhotoPills and the expert knowledge of Marco Grassi to always be at the right place at the right time. We’ll do it again in Faroe Islands! We're offering you a €500 discount on the regular price! All you have to do is to book 1 of the 12 spots available before Sunday February 17th. Read carefully all the details of this unique adventure. And when you’re ready, fill in the booking form. Please, book as soon as possible. The seats are sold on a first come, first served basis. We’re recruiting 12 brave PhotoPillers (PhotoPills and photography nerds) to join us on a 8-day expedition to photograph August’s golden light (and the Moon) along with some Faroe Islands’ treasures. 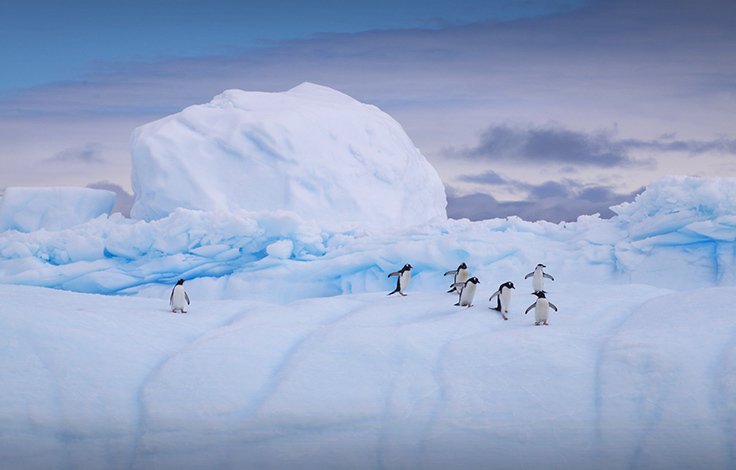 It’s a non-stop adventure to chase legendary photos and you are a key asset! But we also want to maximize our flexibility in terms of itinerary and schedule in order to take advantage of all the opportunities that the changing weather will surely put in our way. If we see something interesting happening in the sky, we’ll pick the best location possible, stop and take advantage of the occasion. This adventure is going to require a lot of physical effort... But it's going to be so fun! You land at Vágar airport, the only airport in the Faroe Islands. Welcome to the North Atlantic sea! When ready, we’ll jump onto the vehicles and drive towards Tórshavn, the capital, to check-in in the beautiful Hotel Føroyar... our home for the first two nights. Back to the cars and off to explore Tórshavn, the largest town in the Faroe Islands. Located in the southern part on the east coast of Streymoy (1 of the 18 islands in the Danish archipelago), more than 21,000 people live in Tórshavn. It’s by far the most vibrant town in the country. Although the exact date the town was established remains unknown, its origins go back to the time of the Vikings (around 900AD), when the first settlers arrived by longboat from Norway. It’s an interesting place to begin our adventure, isn’t it? After a quick dinner (and grabbing some food for later), we’re heading towards the village of Gásadalur... where the stunning waterfall Múlafossur awaits! Until the tunnel was built in 2004, you could only reach this isolated community (i) hiking over the 700m (2,300ft) mountains, (ii) by boat or (iii) by helicopter. So there is plenty of time to explore the area! Use the PhotoPills Augmented Reality tool (and the Planner) to find your composition. And get ready for the light to come (or for the Sun to be at the right spot in the frame). At around 10:10pm, you can go to one of the best spots where you can capture the Moon along with the spectacular Tindhólmur and Drangarnir. Moon over Tindhólmur and Drangarnir. There is a beautiful sunrise from the top of Sornfelli mountain, some 12km (7.5mi) away from Tórshavn. Blue hour begins at 4:26am, sunrise is at 5:26am, and golden hour ends at 6:31am. Lunch time at the Gras restaurant (Hotel Føroyar). We’ll head to Fossá, the tallest waterfall in Faroe Islands with a height of 140m (460ft). Surrounded by mountains, this fairy tale village of green-roofed houses is located in the fjord, by a tidal lagoon. We’ll spend the afternoon taking advantage of the multiple photo opportunities. It’s the perfect place to photograph the sea stacks Risin og Kellingin (the Giant and the Witch) at sunset (9:41pm). The Giant (Risin) is the 71m stack further from the coast, and the Witch (Kellingin) is the 68m (223ft) pointed stack closest to the shore, standing with her legs apart. Why are they called the Giant and the Witch? Sunset the black beach of Tjørnuvík with the Giant and the Witch. Moon shot on our way back to the hotel (during blue hour). The southernmost of the Faroe Islands! After a 2-hour ferry, we’ll get to Suðuroy... Probably one lesser explored islands of the archipelago! We’ll spend the day exploring the island... And, trust me, there is a lot to see. From giant cliffs (reaching 470m or 1,542ft), small villages, and black sand beaches to a beautiful lighthouse, the southernmost point in the Faroe Islands. We’ll stop for lunch and we’ll keep going up and down the island. Dinner on the ferry back to Tórshavn. Golden hour begins at 8:31pm. While the Sun goes down we’ll be heading to Vágar. At the end of the golden hour, we’ll stop on our way to photograph the Moon (99.6% full) rising next to the island of Koltur at 9:48pm. The light will be great. Expect a powerful yellow Moon. Check-in in Hotel Vágar. We’ll stay here the next three nights. Island of Suðuroy: Beinisvørð sea cliff (highest sea cliff in Suðuroy, 470m or 1,542ft), Eggjarnar sea cliff, Asmundarstakkur sea cliff, Sumba village and the Akraberg lighthouse. Known as the Witch’s finger, Trøllkonufingur actually means the Troll woman’s finger. It’s a 313m (1,027ft) tall monolith on the south-east side of Sandavágur. Only 11 people are known to have reached the top. Blue hour begins at 4:34am, golden hour begins at 4:57am, and sunrise is at 5:32am! We’ll drive to Bøur where we’ll take a private boat to Tindhólmur. With an area of 0.65 square kilometres (0.25 square miles), this uninhabited islet has its name from the five peaks, which are named Ytsti, Arni, Lítli, Breiði and Bogdi (Farthest, Eagle, Small, Broad and Bent). It’s highest point is 262m (860ft). Expect to be alone on the islet (well, we hope so!). Let’s take advantage of it. It’s time to look for a vantage point to photograph one of the most beautiful scenery in the Faroe Islands – Drangarnir, the sea stacks. Once on the ground, we’ll hike a bit until we discover the stunning view of Drangarnir and Tindhólmur. Mykines, the puffin island, is not too far away behind them! After a quick dinner, we’ll look for some great compositions and wait for the beautiful light to come. Golden hour begins at 8:29pm, sunset is at 9:34pm, golden hour ends at 10:08pm, and blue hour ends at 10:31pm. Sunset here will be legendary! Boat back to Bøur, and from there we’ll head back to the hotel. Sunrise at Trøllkonufingur, the Witch’s finger. Ferry to Mykines, the paradise of birds (especially puffins)! But once on the island, there is so much to do! Another boat is waiting for us. But this time, we won’t be going into the wild sea... we’ll sail along the Sørvágsvatn lake. At the end, where the lake meets the sea in a beautiful waterfall, the Sun will be setting along the coast of Vágar and it will be aligned with a few giant sea stacks. Golden hour begins at 8:26pm, sunset is at 9:30pm, golden hour ends at 10:03pm, and blue hour ends at 10:26pm. Boat back and to Hotel Vágar. It’s our last night here. Mikynes island: puffins, villages, cliffs, lighthouse. Sunset at sea stacks at the end of Sørvágsvatn lake. I’ve been giving you lots of details of this amazing expedition to the Faroe Islands. Only two sunrises to go! Blue hour begins at 4:41am, golden hour begins at 5:04am, and sunrise is at 5:38am. Post-processing class and/or PhotoPills Q&A. 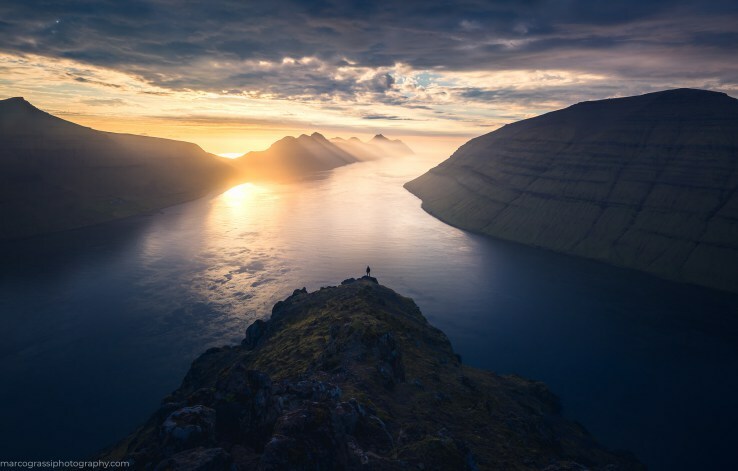 Long as a flute, the island of Kalsoy is a playground for landscape photographers. Only 150 people live on the island, spread in 4 tiny villages... and surrounded by 13 peaks and 11 valleys. Our first stop is Kópakonan – the Seal Woman. We’ll find this statue in Mikladalur, the largest village on the island. It represents one of the best known folktales in the Faroe Islands. The path to Kallur lighthouse starts at Trøllanes. It’s a beautiful 40-minute hike along the green seaside to the northernmost point of Kalsoy. There we’ll find an interesting little lighthouse placed right at the top of an immense cliff. As the Sun goes down, the soft light is all around us. Enjoy! Golden hour begins at 8:19pm, and sunset is at 9:24pm. Time to hike back, get onto the ferry (which leaves at 10:35pm) and stop at our accommodation, Hotel Klaksvík. Kalsoy island: villages, Kópakonan (the Seal Woman), Sunset at Kallur lighthouse. And as usually, we’re ready. By the beautiful Viðareiði Church! But, we’re about to say goodbye to each other. So we’ll have breakfast at the hotel, and drive to Vágar airport. The hotel is about 1h15min drive from the airport, so it’s important to fly in the afternoon. To book your spot to join the expedition to Faroe Islands at a reduced price of €4,000 (the official price is €4,500), a €1,000 deposit is required by Sunday, February 17th. Payment in full is required by April, 28th 2019. Please, finalize your booking as soon as possible. The seats are sold on a first come, first served basis. 8 days of learning, fun and adventure with Marco Grassi, the PhotoPills team and the funniest geek community – the PhotoPillers. Full immersion in the PhotoPills method (Imagine.Plan.Shoot.!). 7 nights of lodging, sharing a double room with another PhotoPiller. A secret activity in day 6. Transport in the Faroe Islands. Flights to/from the Faroe Islands. International medical and travel insurance coverage (mandatory). Do you want an example of how huge this will be? This is a glimpse to what happened in the PhotoPills Expedition to Iceland... But we had so many adventures and so much fun... We can’t wait for Faroe Islands! “From the very moment the guys from PhotoPills announced the expedition to Iceland... I didn’t think it twice! I was using PhotoPills but not at its full capacity, so I had no better chance to learn from the creators of this amazing app. The experience was even more amazing than anything I could have imagined. In Iceland, I discovered a bunch of folks as crazy about photography as I am. I had a blast! "The PhotoPills guys know how to create a fantastic experience. They bring an infectiously fun energy and are always willing to drop some handy photography knowledge on you that you will take with you. You take their trip and you'll for sure have a good time, get some amazing pics and leave a better photographer." “During my experience in Iceland I lived wonderful moments and had surprises that were beyond the expected. It completely exceeded my initial expectations! Sharing knowledge, experiences and ways of working and living photography with such a great group has been one of the most enriching life experiences I have ever had. What’s the temperature in the Faroe Islands in August? August is a very nice month. Temperature varies depending on the area but you should expect the range to be between 48ºF (9ºC) and 55ºF (13ºC). According to statistics, August typically has an average of 13 days of rainfall. Although is one of the driest months, it’s likely to rain. It’s key to wear different layers of clothing (base, middle and shell layers) to be able to adapt to any temperature change and rain. What do you recommend I bring along for the Expedition? Your sense of adventure and fun, your camera and of course your sense of humor. Besides that? When you book your seat, we’ll send you an Information Package that will give you further details and suggestions about what to bring (gear, clothing, etc.). Is travel insurance included in the price of the Expedition? No. Participants are required to purchase international medical and travel insurance coverage. We recommend you to choose a travel insurance that covers trip cancellation costs. We hope you don’t need to cancel your spot, but if a situation arises where you don’t have a choice, our cancellation policy is the following. If you cancel and the expedition to the Faroe Islands is otherwise filled, we'll refund you the full booking fee you have paid, minus a €300 administrative fee. 90 days or more before the expedition: 100% refund, minus a €300 administrative fee. 60-90 days before the expedition: 100% refund, minus the booking deposit paid. 60 days or less before the expedition: No refunds will be given. Refunds will be paid using the same original method of payment. Credits: All images by Marco Grassi. 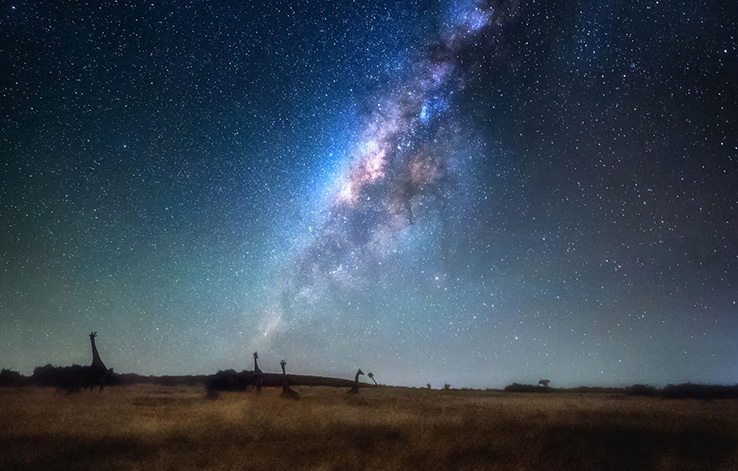 From September 1st to September 16th, 2018 we (the PhotoPills team) will be traveling around Namibia to photograph the Milky Way along with the soul of this african gem… Who is in?